The Canon Auto Zoom 814 Electronic is one of Canon's best Super 8 movie cameras, originally designed to further improve the world-renowned Canon Auto Zoom 814 with many new devices and original functions added to it. Its mechanisms and materials were the object of the most careful research and with it anyone can be sure of taking nothing but the finest pictures. The lens has been newly developed to obtain high contrast and definition to a degree unparalleled in similar cameras. To make this ideal lens work to the best of its capacities, a Servo EE meter, which performs precise measurement, is adopted in the EE mechanism, Variable shutter control, macro-shooting system, and the flash socket synchronized for single-frame shooting are new useful technological advances developed for this camera. 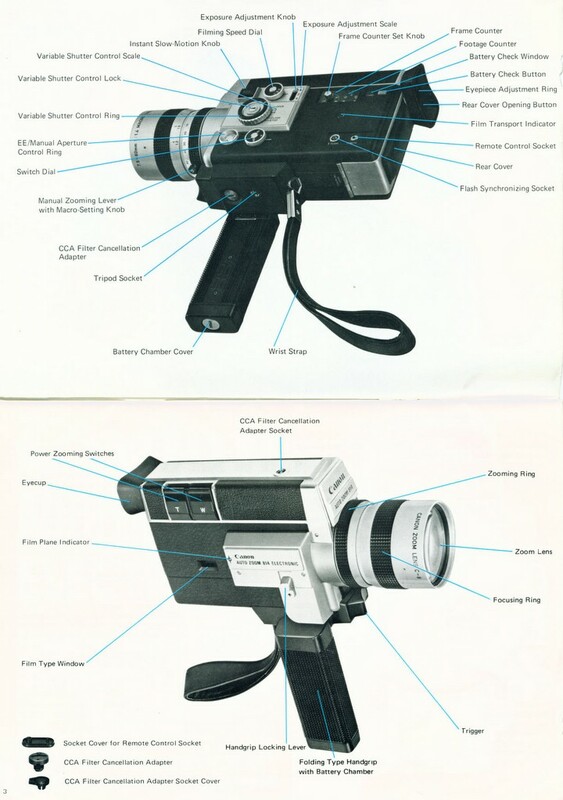 With these, the Canon Auto Zoom 814 Electronic widens the world of 8mm movies. OPEN 150 degrees * 1/43 sec. 1/58 sec. 2 75 degrees 2 1/86 sec. 1/115 sec. 4 37 degrees 4 1/173 sec. 1/230 sec. This camera will meter properly with Kodak E64T Ektachrome film.